Random Handprints - A NYC Mom Blog... live from New Jersey: Instructions for my husband: The chances of getting hit by lightning are not one in a million. Instructions for my husband: The chances of getting hit by lightning are not one in a million. The chances of getting hit by lightning are not one in a million, they're actually more like 1 in 3,000. Lightning is one of nature's biggest killers. But don't take my word for it, read this: Lighting: Nature's Underrated Killer. Lightning claims more victims every year then tornadoes and hurricanes combined. Lightning is the second largest weather-related killer (floods are the worst). The odds of becoming a lightning victim in the U.S. in any one year is 1 in 700,000. The odds of being struck in your lifetime is 1 in 3,000. Most lightning deaths and injuries in the United States occur during the summer months, when the combination of lightning and outdoor activities is at its highest. Always avoid being the highest object anywhere. Do not take shelter near or under the highest object, including tall trees. Lightning can occur before and after storms, so be careful even after you think the storm has ended. Lightning can strike the same place twice, and often does. While I totally admit that I take on the role in our family of neurotically nervous safety mom, I do think a healthy fear of lightening is an appropriate value to instill in our children. Please don't tell them they "don't need to worry" about getting hit by lightning. Instead, tell the kids this, "If you can hear it, clear it. If you can see it, flee it." 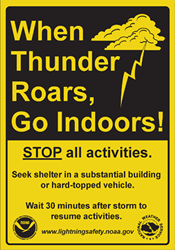 Or, "When thunder roars, go indoors." The kids also need to know not to stand under a tree, on top of a hilltop, or be in or near water. And last, the kids need to know that even when they are indoors they are still not totally safe from lightning. We need to teach them that it is important to stay away from windows and doors and avoid contact with anything that conducts electricity, including landline telephones. The majority of people hurt by lightning at home are talking on the telephone. And no, I don't any of this makes me hyper-vigilant. I think this makes me a good mom, albeit a slightly safety-obsessed one. Information source. More lightning safety here as well. This is my twenty-second instruction for my husband in the ongoing series Instructions for My Husband. What safety rules do you always make sure to follow? this is in NO way neurotic. not at all. someone in my high school got struck by lightening twice. he and his family owned a small-ish farm and he decided it would be a mighty fine idea just to stand outside during a storm. TWICE. When thunder roars. go indoors. The kindergarten teacher in me loves this. The odds are a little scary I must say! I've always gotten off the phone when it storms, but someone told me that it's a myth once. I told them I don't care. I'm not taking chances. Good thing, cuz you confirmed it's true! We always had crazy lightning when we lived in Tampa and you often heard about crazy people getting struck. Definitely something to take seriously!